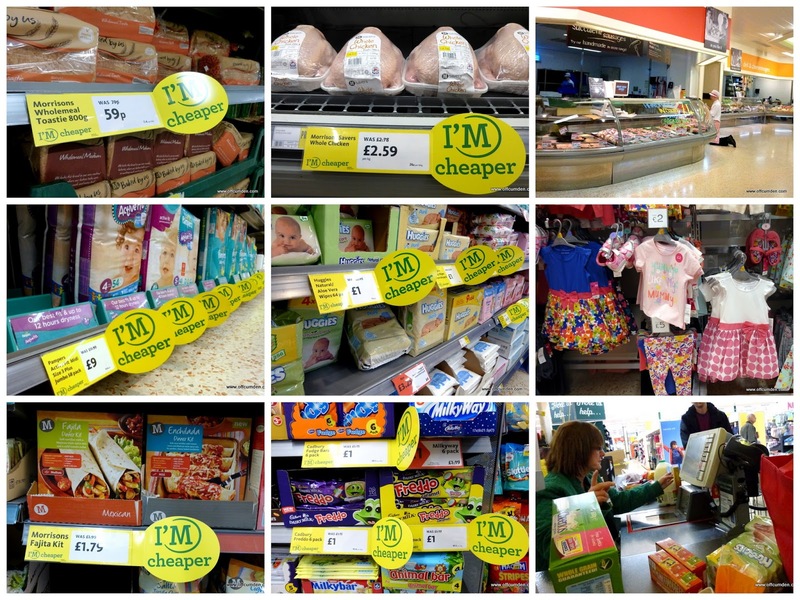 This weekend we were given the opportunity to go shopping in Morrisons, to check out their new I'm Cheaper deals. I was particularly interested to go, given that since Aldi opened a store in our town, we have been there for our weekly shop. Our shopping each week usually costs between £60 and £80, although I do generally pop to the local butcher or the market for meat and extra fruit and veg. I have always been impressed with the fruit and veg at Morrisons though, and their meat as well. In fact it was their vegetables which made me move from Tesco to Morrisons in the first place. I am always a bit freaked out about the misters on the fruit and veg, but I can see the logic behind it. The store was rammed full of bright yellow I'm cheaper signs. I was pleased to find that there were excellent reductions in children's nappies and wipes. My daughter only wears nappies at night now, so one pack lasts a long time. The wipes were really cheap as well, just £3.25 for a four pack of Huggies. I think the Nutmeg clothing range is fantastic. The clothes last really well and are such cute designs, especially the girls clothes. If we ever buy and kids clothes (which is pretty rare thanks to some excellent hand me downs) then I generally buy them here. There were lots of signs around the store highlighting the reductions, but this was my particular favourite. I thought we might have spent quite a lot more than £80. We had 52 items in our basket and some of those were clothes for the kids. In total, our bill came to £80.18. I have to admit to being seriously impressed with the price of this shop and I will definitely be considering changing back from Aldi to Morrisons again. The store was busy when we were there on Monday just before lunchtime. When we got home we made a quick decision to pop out to the park for a picnic. Luckily we live five minutes from a beautiful park, so we headed up the hill with the picnic blanket, some sandwiches and a football. We then found a beautiful spot to sit and have our picnic, right under a vibrant pink blossom tree. It was a wonderful shady spot. Our picnic wasn't extravagant, just some sandwiches, some yoghurt, tomatoes, yoghurts and fresh fruit. It's what our children would usually eat for lunch. These prices are per item and obviously with all of these we have lots left over to use for the rest of the week. So per person it was around £3.81, but as I said before, it probably works out an awful lot cheaper than that if we take into account the fact that all of these products we enough to last for around four lunches (and some, such as chocolate spread and marmite will last for ages). So it was more like £0.95 per person. So per person this worked out at £1.29 per person. We also had some extra to freeze, and obviously still had quite a lot of tagliatelli left over. Thank you very much to BritMums and Morrisons for this opportunity. Disclosure: We received £80 of Morrisons vouchers for the purpose of this post, but this had no impact on the post, which is honest and fair.